I had intended to write the post about the value of establishing a Programme Management Office (PMO). It then occurred to me that implementing PMO implies there is a level of maturity and value of project management is accepted. However, there are plenty cases where project management is either not practised or if practised, done more as a begrudging necessary evil than something that provides a value to the business or to the client. This got me thinking. As a project management professional, what can I point to as value provided by my chosen discipline? More people today pursue project management certification than ever before. Both PMI and The Stationary Office through APMG are making a killing on this. But does that guarantee success? 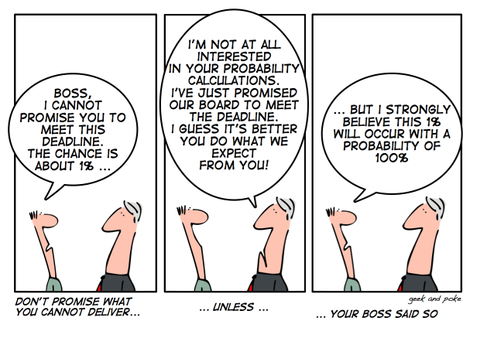 From a sceptic’s point of view, one can argue why bother having a Project Manager. They are not managing children. They’re dealing with grown men, in most cases very skilful ones. Why not simply let them get on with it? First argument for having project management included in your project is to ensure efficient planning and execution. You will need ensure you have appropriately estimated the work, created a schedule, line up the resources at the correct times, control costs and report to the appropriate body in the organisation. One can argue that a Project Manager actually does not do the estimates. It is your delivery staff that do that. Is the Project Manager simply not recycling that, adding a bit of fat and keeping themselves in a job? Could your secretary not do that? After all, how difficult is it to make Gantt charts? These are entirely valid arguments. Many organisations use their project managers in a work distributor role only. This is where they tend to go wrong. Project management is much more than shovelling work around to minions. Monitoring and control is a key part of a Project Manager’s role. Unless you are Nostradamus, not everything will go to plan. This is where a true Project Manager earns his money, by adjusting within tolerances afforded to him, or passing up the chain if a decision is required at that level. They plan risk and issue management and monitor these actively and implement the appropriate actions if they materialise. Many a project go wrong without good scope control. While this may be an unenviable job, this is absolutely necessary if you want projects coming on time within budget. An often understated part of a Project Manager’s role is leading the project. If you want to see the effect of leadership, or lack thereof, a study of the New Zealand political scene is a must. The National Party, routed under the leadership of Bill English not too long ago, now sits with a comfortable majority in Parliament and are odds on to be re-elected under John Key, with English his deputy. At the same time, the NZ Labour party, after three successful terms under Helen Clark, struggles to be an effective political force under Phil Goff. If you reviewed the political manifesto for either party, you would have struggled to distinguish between them. A Project Manager with personality and character has the same effect. The organisation has to decide what their mode of operation is. Is it one that treats Project Managers in a shovelling work capacity, then likelihood is they view it as a cost to the project. In a services context, they allow their customers to easily talk them out of this necessary skill when push comes to shove about pricing. These are usually the projects that end up costing money, since the effort to deliver them with the necessary quality was underestimated to begin with, risks are not attended to in time and need for adjustments are picked up too late to be effective. Organisations that value project management skills as a necessary component that adds value by ensuring a quality delivery and build capability in this area are the ones that usually reap the benefits. You deserve the project you get. Is this being too simplistic? Let me know.